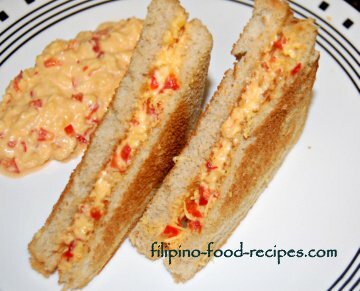 The Filipino cheese pimiento recipe is a spreadable cheese spread with sweet peppers. This is more of a sandwich spread rather than a dip. Most other recipes uses mayonnaise, or butter -- but this one is like no other. For cheese, I particularly like american cheese, Velveeta or any quickmelt cheese. Choose one that you like to snack on as it is. My Aunt Letty Gozon taught me to use evaporated milk for a spreading consistency. However, milk by itself is too liquidy, so we add hot butter to melt some of the cheese and make the spread a little thick. Now, let's talk about pimientos. 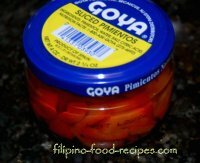 If you can find canned or jarred pimientos, that's the easiest way to do. Though that will be more expensive than making your own with red bell peppers. Some might argue that pimientos are cherry, not bell peppers. The red bell pepper is a kind of sweet pepper, just like the cherry pepper. The RED is sweeter than the GREEN, so don't use the green for this recipe. Simply blanch and chop the red bell peppers and you're good to go. See the tips below for more information. 1 Mix the cheese, pimiento and evaporated milk thoroughly. 2 Add the hot butter and mix to have a spreading consistency. 3 Season with salt and pepper to taste. 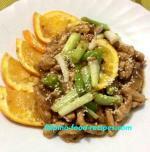 4 Spread onto slices of toasted loaf bread and serve as a snack or merienda. For easier shredding and handling, freeze the cheese for at least an hour. No Canned Pimientos? Use RED bell peppers. Drop a whole red bell pepper onto boiling water for 2-3 minutes, remove seeds and ribs and chop finely. Do not remove the skin of the red bell peppers, or you would end up with a pale red, almost orange color pimiento. If you can find the small sweet cherry peppers, use them instead of the red bell peppers. They are usually sold as ingredient for salads. Substitute regular milk, cream or half and half for the evaporated milk if you don't want the spread to be a little on the sweet side.